Handicrafts are the drawing card as Okinawa City lures you to visit. The third annual Okinawa City Handicraft Fair’s coming up in a week’s time, and organizers are pulling out most of the stops to make the long Thanksgiving weekend a time of fun and festivities on the island. The three-day festival runs Friday, Saturday and Sunday, November 26~28 at the main stage on Palmera Street in Koza, Okinawa City. Merchants are the driving force behind the Fair, during which they’ll take every opportunity to showcase their wares. The Park Avenue shops and stores are instrumental in organizing the festival, and are making special ¥500 “Fureai Tickets” available to the first 50 shoppers purchasing their products during the fair. There’ll also be free candy to the first 50 people who show at the main seating arena for the shows. As with all festivals, it’s a mix of food, fun and frolic. Entertainment stretches across the three days, beginning with a parade and live comedy on Friday. Saturday there’s street dancing, Eisa, live performances including one by Kotora the clown, and music by DJ Mi Bo. Sunday there’s more music from Studio 1.2.3, Afromania, Nenes and the Tobi Asato Drummers. 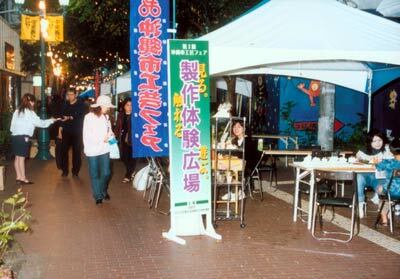 The Handicrafts Fair is operational 11am~8pm Friday and Saturday, and 11am~7pm on Sunday in the Goya area’s shopping malls on ChuoPark Avenue. Everything is free, including opportunities to handle died fabric, pottery and textiles. The fair is designed to promote industrial business solidarity in Okinawa City, attracting new consumers to appreciate the time honored arts and traditions of traditional handicraft goods. While soliciting new customers, the merchants also want to show appreciation for the loyalties of shoppers who’ve been with them for a long time. It’s underwritten by the Okinawa City Handicrafts Business Promotion Society, the Okinawa City Board of Education, the Okinawa City Chamber of Commerce and the Okinawa City Tourism Association.